Eric simply let himself slip, but when he realized he wasn’t alone, that BodySpace was filled with others like him, he turned his life around and built an admirable body! I was an athletic child and young adult. However, once I turned 30 it all went downhill. Slowly, but surely. I still worked out but without consistency. On top of that, I never paid attention to my diet. Every year I gained a few extra pounds. Four years ago, when my wife and I had the first of our youngest two children, I gave up on working out and opted for a much easier and pleasant hobby: Wine "tasting" ... or at least that's what we called it as we indulged almost every night in drinking wine to "unwind." Not the best example for our children. Fast forward four years and another child and I was completely out of shape, unhappy and unmotivated. 2012 was just going to be another year when I promised myself "things" were going to change, and once again I did nothing to fulfill that promise ... Until I saw the Optimum Challenge on BodySpace and thought it might help me with getting started. 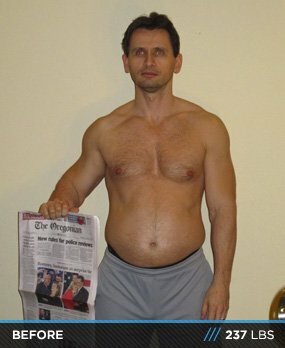 I signed up for the contest and the "100k Transformation" BodyGroup in early January. I am SO glad I did. The BodyGroup and the well-defined goal completely changed my attitude. My motivation went` from dead to over the top. I started over-obsessing about my workouts, my food and the forum. Within just a few weeks I started to feel younger and rejuvenated. Now I am addicted to this new lifestyle. I was not foreign to workouts, but dieting and losing body fat was a new concept. I decided to get help from my best friend and trainer extraordinaire Dennis Traylor. Dennis also competed in several natural bodybuilding competitions and was experienced with prepping for a bodybuilding-like contest. He put together a simple diet plan that would work with my busy life. While training with me throughout the 12 weeks of the competition, we constantly tweaked all variables of the equation based on my progress. The goal was to drop about 2% of body fat per week while minimizing muscle loss. The body believes in biology, not magic. There are no tricks, only work. The first 2 weeks of training and dieting were a breeze. It was a nice 360 turnaround from the previous 4 years. At the end of week two however, I hit a wall. I craved desperately the return of all the bad habits I had developed over the years: wine, margaritas, gummy bears ... even ice cream. I had a total mental relapse. All the hard work seemed to have vanished. I was ready to give up and go back to my "30s" version of my body. Then I visited the "100K Transformation Challenge BodyGroup" and wow. So glad I did. I realized I was not the only one struggling with the same demons. I gathered up my courage and posted about the fight against myself. So many people replied in support. I was hooked and a fresh wind was now blowing in my sails. I was ready to resume my journey and put the struggles of the last few days behind me. The next 10 weeks almost seemed too easy. With Dennis and the BodyGroup, I felt unstoppable. Every morning I woke up and couldn't wait to train. I did the basic 6-7 balanced meals throughout the day. I'm 6-foot-2 and started out at 237 pounds. My goal was to eat about 2,500 calories per day with 250 grams of protein, 250 grams of carbs and the rest was natural fats from my food. On my days off, I would replace all the carbs with healthy fats (almonds, avocados, etc.) I tried to NOT eat carbs (beside vegetables) past 1pm (no rice, sweet potatoes, etc after lunch). I had to fit all my workouts in a busy schedule and keep them simple. I never spent more than one hour at a time in the gym. I constantly change up my workouts. I am also more of a volume guy vs. going heavy every single day. The exceptions are deadlifts and squats where I like to put some heavy weights (at least heavy for me). Throughout the 12 weeks, I did cardio pretty much every day, twice per day. First thing in the morning at 5 a.m. then first thing after work around 5 p.m. Each session varied based on my energy level from 20-to-60 minutes. I mostly used a stationary bike at very low intensity (often while watching TV). I had to work out around several injuries (elbows, knees and lower back) which limited me to properly train shoulders, chest and triceps. I did one body part a day to reduce my gym time and stress on my body which needs a little more time to recover today at 40 than it did at 25. Set a well defined goal with an end date. Get a support group or friends or family to help you get through hard times. Don't look for magic in the form of supplements or secret workouts. Educate yourself! Too many people just blindly read or listen to advice from the gym, the Internet, their neighbors, etc. without learning the basics. Don't hesitate to adjust your food intake, workouts or supplements. Try volume and heavy training. Don't limit yourself to only one of them. It's now 12 weeks later and I'm 35 pounds. lighter. I can't believe I was that heavy. I'm in the best shape of my life. I weigh less than I did when I was in college. My blood pressure and cholesterol dropped in double digits. My overall outlook on life has improved by 200%. Best of all, I am a much better father to my wonderful kids. Not to mention my wife loves her husband's new body. People in the gym, at work, and almost everywhere have noticed the change and I receive random compliments daily. Who said you can't be 40, manage a professional career, a family and be in great shape?! With the help of Bodyspace/Bodybuilding.com, its patrons and sponsors, I feel so blessed and so fulfilled. Joining the Optimum Challenge was one of the best decision of my life. Thanks! He did it for himself, but his family is also rewarded by his improved self! I have to thank my best friend and personal trainer Dennis Traylor. Without his push, daily training, nutrition and supplement tips I would have never made it. If you are looking for a great trainer give me a buzz! Naren Nayak took all of the final shots and they look fantastic. Go take a look at his work. Thanks Naren. You are THE MAN. Finally, the most important reason to my success - my wife. My wonderful wife was so supportive, understanding and patient throughout the entire process! She not only put up with my obsession, but also relieved me of some of my usual home chores and duties. Thank you honey. I could have never done it without you!